Most people have the wrong idea of what balance means, especially when it comes to work-life balance. 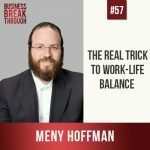 According to Meny Hoffman, CEO of PTEX group and proud husband and father of seven, work-life balance means giving 100% to whatever and whoever needs it at the time, rather than giving splitting your time and energy evenly between the two. Tune in to hear how Meny has managed to give the best and the most to both his family and his business throughout 18 years in business. In this episode Meny shares also pearls of wisdom on how to deal with competition, hire your first employee and grow your business, plus his struggle of turning down opportunities that he would have given anything for in the early years of his business. 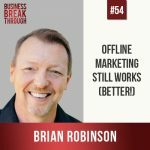 Brian Robinson has mastered the art of offline marketing in 2019, an art that has been almost forgotten, but is still highly successful! In this episode, Brian gives us a step-by-step run-through of how to create a direct mailing campaign, covering everything from the size of the envelope to the content of the letter. 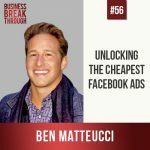 He also shares his journey where he went from working in corporate sales for Coca-Cola USA and Johnson & Johnson, to doing cold sales for a brand new and unknown start-up that sold on-hold messages to banks and credit unions. Plus, Brian shares his struggle of trying to sell on-hold messages to business owners who are not aware that their customers are ever put on hold. Tune in for an episode packed with intriguing stories and incredible value! Jake Sussman studied law in Harvard and was all set for his career as a lawyer in one of the big law firms when he discovered that he could use artificial intelligence to solve one of the biggest pain points for lawyers, and make a lot of money at the same time. This revelation lead to his start-up, Evisort, a company that uses artificial intelligence to extract key data and legal terms from contracts. 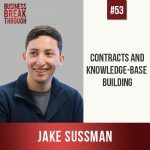 In this episode, Jake takes us on a guided tour of business contracts including how and when to set them up, the key business and legal terms and the importance of filing and storing your contracts. He also shares his struggle of bringing his team from five employees to thirty in the past year, and the solutions he came up with to improve and speed up the onboarding process.